With steamers becoming more affordable by the day, anyone can pick up a decent unit that will kill bed bugs. Before you pick up the fabric steamer in the closet, be sure to check that it meets the necessary steamer specifications to actually kill bed bugs. With the wrong tools, you’ll blow bed bugs across the room and deeper into furniture instead of killing them. It is a well documented fact that heat created by bed bug steamers is enough to kill both bed bugs and their eggs upon contact. This is a great way to treat for bed bugs on upholstered furniture, as well as throughout other areas of the home where bed bugs have been found but bed bug sprays and powders aren’t ideal due to the dangers of excessive contact with exposed skin. When it comes to the bed specifically, this is my preferred method hands-down. A steamer does an excellent job of sterilizing your mattress and bed frame before encasing them in bed bug proof encasements! Please be sure to allow any residual water to evaporate before encasing your bed to prevent mold. Also, ensure that whatever you decide to steam is able to take the heat without suffering damage. With those words of warning out of the way, here is my up-to-date list of best-value picks in the world of bed bug steamers. You can read more about exactly how to use your bed bug steamer after the reviews! Steam cleaners provide an all-natural and residue-free way to kill bed bugs on contact. After the upfront cost, all you’ll need is water. As with any bed bug killing plan, a steamer should be just one part of your multifaceted approach. Following an IPM is the only way to eliminate bed bugs instead of continuously battling them. 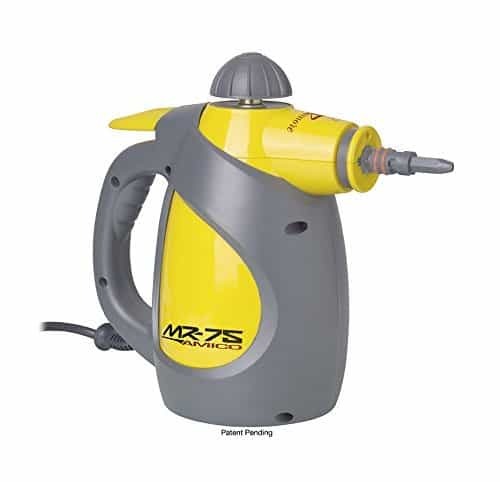 The Vapamore MR-75 is the obvious choice for those looking to pick up a portable and affordable steamer for small jobs. While other steamers are capable of steaming rooms at a time, the Amico does a great job when dealing with furniture and similar manageable jobs. Unlike the other steamers, the Amico heats up in a quick 5 minutes and features intuitive 1-button operation. It is also notable for its many included attachments that will help tremendously with any job that includes hard to reach spots or wide areas. Its PSI is almost as impressive as its price – the MR-75 packs a lot of punch into a small hand-held canister that certainly won’t disappoint. If you’re interested in taking a primarily chemical-free approach to your bed bugs on a budget, the Amico may become a key part of your IPM. You’ll be much safer if you pick up a spray to supplement the small steamer and provide deeper residual defense. Be sure to wipe down your treated surface after steaming to avoid water damage – this steamer doesn’t produce the driest steam. For its price, the Steamfast delivers in a big way. While not as hot or high-pressured as the Primo, the SF-275 manages to reach well-above the required temperature of 160˚F. 44 PSI is enough to reach most bed bugs, but will have difficulty penetrating significantly deep into objects. Its tank allows for a great 40 minutes of treatment that will allow you to effectively treat all the nooks and crannies you could possibly find in a room. The 17 included attachments ensure that you’ll be well-equipped for any scenario! The Steamfast offers good value but won’t penetrate very deep due to its relatively low pressure. With the smaller and cheaper Amico on the market, you’d be better off picking up that and a good quality spray that will guarantee good results. For those on a tighter budget, the Steamfast will do the job. I would encourage you to consider the more powerful Vapamore if steaming will be a core part of your IPM. It’s hard to find consumer level steamers that deliver what the Primo does. Of the steamers reviewed here, it has the lowest % of water vapor by volume – meaning that it gets things the least wet and dries the fastest. It’s also received meaningful safety certification and the only lifetime warranty of the bunch. The huge amount of pressure available allows steam to penetrate deep into cushions and crevices where bed bugs love to hide. The greatest advantage of the Primo, however, is its ability to adjust the pressure output. at the tip. This feature is typically only available in steamers several times more expensive and allows for the right amount of pressure depending on the surface you’re treating. With variable adjustable pressure, you’ll never blow bed bugs off of hardwood after steaming you mattress. If you’re serious about treating bed bugs the natural way, a quality steamer like this one is going to be absolutely integral to your IPM. I wouldn’t recommend getting anything less effective than the Primo. I recommend the Vapamore Primo for its high temperature, great price, and its unexpectedly high-quality features that I’ve highlighted above. For the price, there is no better value in the world of steamers. This is the highest quality steamer I’d recommend for personal use. With its immense 65 PSI of pressure and 240˚F of bed bug demolishing power – the next step up from the Vapor Clean II would put you in the realm of professional steamers. Nothing else on this list comes close; its the most premium and most costly of the lot. 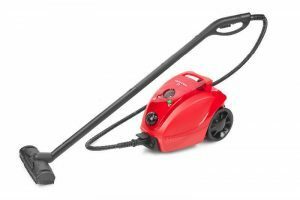 Should you be interested in treating your bed bugs naturally without sprays, this steamer will absolutely replace them in your IPM. The Vapor Clean II is a quality steamer completely made in Italy with safety certifications and a lifetime warranty to boot. 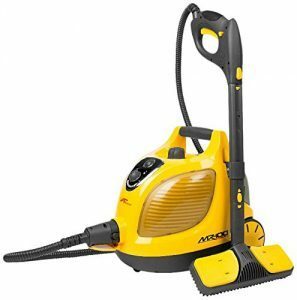 Its steam will penetrate very deep into furniture and cushions – you’ll be astounded by the results you get from a single pass through any harborage zone. Bugs, eggs, nymphs deep inside mattresses; nothing is safe from the Vapor Clean II. 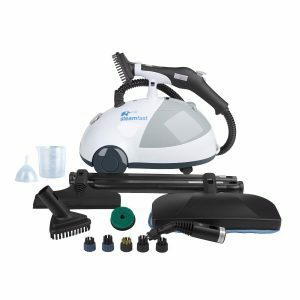 I’ve created the most extensive and detailed guide on the internet to finding a steamer powerful enough to kill bed bugs so that you can get started with this effective, natural, and affordable tool today! Take the time to find a model that fits the size of your project and budget. If self-treating, it’s very important that you have the right bed bug fighting tools. Every advantage will be necessary. Investing in the right model and learning proper technique will give you access to one of the most effective and widely used bed bug controlling weapons. Many professional operators use steam as a part of their integrated pest management because of its instant effectiveness and low cost of use. If treating your own bed bugs, a steamer is just one part of a larger Integrated Pest Management approach. It’ll take place of contact killing sprays you’d otherwise have to rely on. Creating your own IPM with the help of our page and following it is the best advice you’ll get on killing bed bugs anywhere. Fabric steamers are great at steaming fabric. Dry steamers are great at steaming anything you don’t want sopping wet. Calling steam dry is a misnomer; in commercial steamers, your steam is going to leave moisture wherever it passes over. That being said, dry steam contains much less water than regular wet steam and leaves your walls and bed much less damp as a result. Dry steam also transfers heat more efficiently, meaning greater kill potential with dryer steam. The primary variable that determines steam dryness is pressure (PSI). Generally speaking, you’ll find that steamers with a higher PSI yield both higher temperatures and dryer vapor. In choosing a dry steamer, I would look at nothing lower than 50 PSI. If on a budget, cheaper steamers do exist, but will produce wet steam. Don’t bother with anything below 40 PSI. We know that bed bugs are instantly killed at 180˚F. 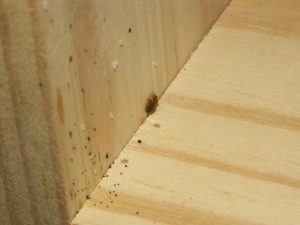 Heat is great when it comes to getting rid of bed bugs because it affects them at all life stages; most significantly, this includes their eggs. Many chemical contact killing sprays haven’t cracked that benchmark yet. When it comes to steamers, it’s best to overshoot that temperature since heat is very quickly dispersed, and because there will typically be a lot of insulating fabric protecting the bugs. I would not recommend any steamer that fails to reach a temperature of at least 200˚F at the tip. The tip commonly refers to the nozzle or head of the steamer. Steamer nozzles come in a variety of shapes and sizes. Straight tubes and typically vacuum-like wide heads are two common varieties. When it comes to killing bed bugs, you’re going to want to grab the wider head. A wide head helps disperse the high-pressure steam so that bed bugs aren’t blown all across the room. They also cover more ground while still reaching temperatures necessary to kill on contact. A wide-headed nozzle means fewer passes necessary to completely treat areas, fewer refills, and bed bugs not flying away or otherwise avoiding larger sweeps. Avoid bristled heads that could brush bugs aside rather than kill them. You’ll be surprised to learn that the size of your steamer’s water reservoir has heavy implications on its effectiveness. When it comes to securing a room and treating it for bed bugs, time is of the essence. Having to let a steamer cool down, refill, then heat back up every 10 minutes because of its dinky water reservoir is not optimal. Given a chance, bed bugs will flee from areas recently treated. You’ll only be able to do so much with a 10-minute window. Stragglers will inevitably make it. Ideally, you’re going to want to treat significant swathes of an area with a single tank. I recommend a capacity of 5 cups at the very least. This should afford you at least 30 minutes per session, more than enough to treat your entire bed including headboards and footboards. Steamers on the higher end of the spectrum will have larger capacities or a continuous fill feature, which allows you to fill the tank as you go. Industrial steamers mostly include it. This eliminates the need to cool and reheat the unit and would allow you to treat an entire room in a single session – a huge advantage. Here’s a video guide on the subject for the visually inclined. Jeff from Bed Bug TV does a thorough job of demonstrating proper steam machine usage to treat for bed bugs here. Here are the key takeaways you can keep for later. Most steamers that claim to be fit for killing bed bugs will advertise a tip temperature of at least 200˚F. It is still best to independently verify the number to avoid spreading your infestation instead of eliminating it. If you’ll be investing in a steam cleaner, I recommend also picking up a simple infrared thermometer. After treating a surface in a testing area, the infrared thermometer can be used to ensure that target surface shows at least 160-180f. You can also use a meat thermometer if you’d rather use what you have available. Holding the thermometer in front of the steamer will not give you an accurate number. Instead place your thermometer on a surface fit for testing the steamer. Run your steamer over the area at the recommended rate of 1 inch per second. Watching the thermometer as the temperature peaks should give you the proof you need. The greatest advantage of steam cleaning is its limitless applications. Baseboards, walls, beds, carpets, cracks, and crevices are prime bed bug harborages that steamers make quick work of. You can use a steamer wherever bed bugs like to fester. Steam is especially appealing when treating sensitive areas like beds, couches, and sofas. You’re probably not interested in sleeping on a pesticide-blasted mattress or sitting on a sofa covered in amorphous silica. No matter how natural and harmless pesticide sprays and dusts claim to be, there’s no questioning or justification needed when utilizing pressurized heated water in the form of steam. When utilized as part of integrated pest management, steam is an extremely effective tool. Just like any other item in our toolbox, steam will not accomplish the job of eliminating bed bugs on its own. Unlike many other items in the bed bug fighting arsenal, the cost of refills is moot. A steamer is an intelligent long-term investment to make that will absolutely pay dividends when used correctly as part of a greater plan. If you take the time to learn about a few methods that get rid of bed bugs and put a several into practice, I promise that you will see results. I will be updating this post with product recommendations and reviews in the near future once I have the chance to do more research. Thank you for reading and best of luck getting debedbugged! Thanks for the comment! I’m glad it’s been useful for you.